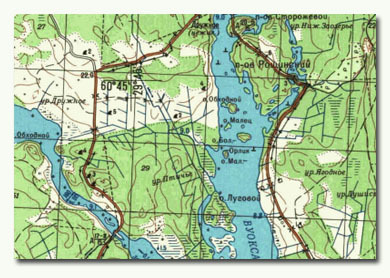 As you possibly know, most digital topographics maps came to PC from a paper scan. Original paper quality may be not enough good, especially for old maps. 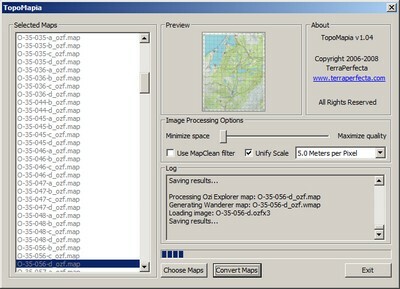 MapClean filter is an image filter added to TopoMapia that allows you to get more clear map than it's original. 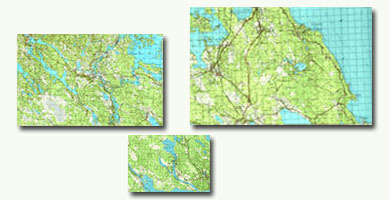 Scanned topopgraphic maps may differ from each other by digital scale. For example, if you have two paper maps with geodetic scale 1 cm per 1 km, and scan it with differ resolutions, you'll get the maps that couldn't be merged. After calibration in geodetic software, you'll get 1 pixel per 1 meter for one map, but 3 pixels per meter for the second. This is very important if you are trying to import set of topographic maps for some geographic region. 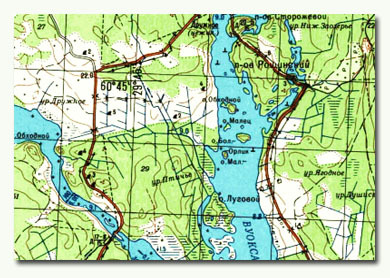 Original Maps. Equal paper areas, equal geodetic areas. Different digital resolutions, different meters per pixel. TopoMapia lets you fix this problem using digital scale unification. You'll be able to choose the digital scale (meters per pixel or MPP) you need. Moreover, you'll be able to reduce different map sets (e.g. for different regions) to common MPP. After Scale Unification. Equal paper areas, equal geodetic areas. Equal digital resolutions, equal meters per pixel.